After completing my yoga training I decided to spend time studying, practicing, and exploring each of the yamas (self-restraints) and niyamas (observances). The yamas and niyamas are two of Patanjali’s 8 limbs of Yoga. I did not outline the order of my studies; instead, the order is organic. When I find myself falling out of my yoga practice, developing a habit that does not serve me or others, or losing touch with myself I look to the yamas and niyamas to help determine my next topic of focus. I am currently focusing on the niyama santosha. This niyama is about mastering the art of feeling at ease and at peace with yourself. I consider myself an extrovert. I enjoy spending time with others; I recharge when surrounded by others that I love and trust. However, my current work travel schedule has forced me to seek out other means to recharge and refuel. I am learning how to make myself happy and how to find balance in an hectic ever-changing landscape. I was and will continue to be on the road without friends, family, or coworkers for several months with no breaks. When on the road, I find myself pining to be back at home; I desperately miss my friends and family. I miss my routine and my personal space. It sometimes hurts to talk with my loved ones on the phone and via text. Hearing about all the special events and get-togethers I am missing makes my time away from home even more difficult. Less than two days into my first trip, I started to countdown the days until my return flight. I did not allow myself to be happy or to live in the moment; instead, I was caught up in my head and busy anticipating my return flight. I saw myself veering off on a negative path and decided to focus on the niyama santosha in order to overcome my travel woes. Transformation is not an overnight process. Change takes work and time. I decided to focus on striving towards small attainable goals first. 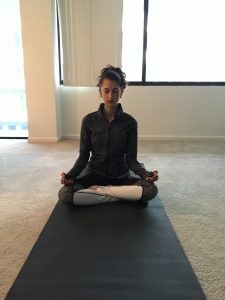 I read several articles regarding santosha and decided to develop a morning routine to help ground me and to allow myself to start living in the moment instead of in the future. My morning routine consists of a short yoga sequence and meditation that incorporates a mudra and a mantra. I decided on the yoga sequence based off of guidance I found on-line. I incorporate heart openers into my practice and end each practice with supported bridge pose and savasana. During meditation, I sit with my hands in Jnana mudra, a gesture of wisdom. Throughout the sequence, I chant to myself “om shanti shanti shanti.” The mantra helps to instill the importance and power of peace and calmness; it also helps me to remain present and to keep my focus on the mat. Shifting my focus away from my return flight and towards santosha has helped me to become more present. When I find myself rushing to get to the next thing, I try to take a step back and appreciate the current thing. Every moment only happens once, and I am present in the current moment for a reason.